It was just past noon as Avingard entered Whiterun, which seemed to him to be a rather well-populated and busy city. There were buildings on both sides of the street, and as far as we could tell there appeared to be a market at the far end. A blacksmith shop was off to his right, as he could see the equipment outside off to the side of the shop. Out front a Nord man and an Imperial female were engage in a conversation. Avingard could begin to make out what they were saying as he approached. Seeming satisfied with the answer, the Nord turned and walked away. The Imperial went back to work at the blacksmith, but then stopped as she noticed Avingard standing nearby. “Well, Avingard, what can I do for you?” Adrianne asked. “What can you tell me about Whiterun?” Avingard questioned seeming more interested in the large city the more he looked around. Avingard looks up towards Dragonsreach, which looks like to provides an overwhelming presence through the Whiterun hold. After turning back to face Adrianne, who has just gone back to her work, he asks her about the items she has to sell. After listening for a few minutes as Adrianne goes over some of the items, especially armor to replace his current iron armor, Avingard realizes he just doesn’t have enough to upgrade just yet. He says goodbye and continues down the street towards the market. 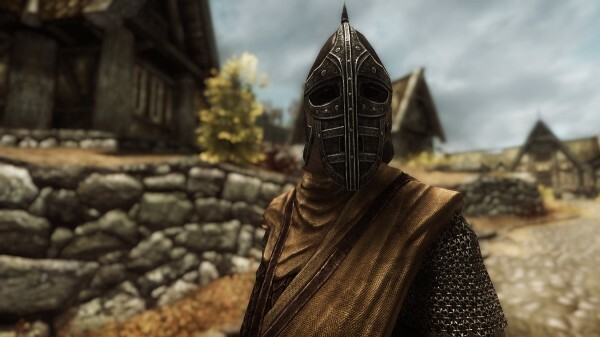 He passes a Whiterun guard along the way and could feel the guards gaze, through the full-face helmet, on him as he passes by. Avingard realizes that he is a traveler to Whiterun, so he will be expecting a few gazes from some of the citizens of the city. 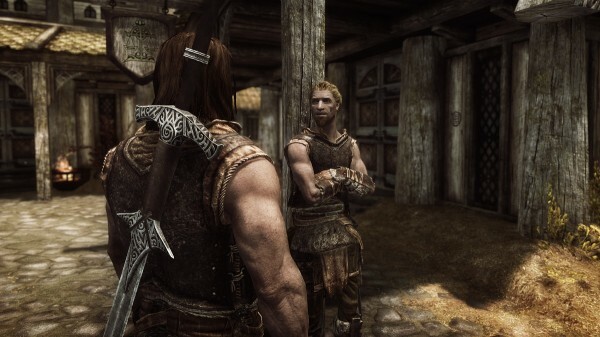 “Just passing through,” Avingard replied since he couldn’t really think of a purpose for visiting Whiterun other than stocking up on supplies. “Aye, that I do. Have all my life. We Battle-Borns have been here since the beginning along with the Gray-Manes. Our families have been close kin for generations, but Ulfric Stormcloak’s uprising has divided us. Now it seems we can scarce look at each other without coming to blows. Petty and foolish, that,” Jon explained. Avingard talks with Jon Battle-Born. Avingard begins to understand the effect the Civil War is having on the citizens of Skyrim. Not wanting to bring up the topic again, he decides to change the subject. “Where can I get a drink,” he asked. “You don’t like Mikael?” Avingard asked curiously. Avingard, realizing that he had brought up another touchy subject, simply thank Jon for the information and proceeded to walk away. “May your sword by sharp, and our tongue sharper,” Jon said as Avingard turned to walk.